In a region already characterized by high variability in the current climate, climate change represents additional risks for society, economic sectors and the environment. This changing risk profile will have an effect on the outcome of a wide range of decisions affecting individual, societal and economic well-being. In order to plan effectively, decision-makers must assess and be aware of these changing risks. As our understanding of climate change improves it is becoming possible to gain increasing confidence about some of the expected changes, such as increasing temperatures. However, our knowledge of the climate system is not perfect, resulting in uncertainty around the precise extent of future climate change. Furthermore, we cannot know how future emissions of GHGs will change. Uncertainty also stems from our incomplete understanding of the impacts of future climate on society, the environment, and economies. Despite these uncertainties and regardless of the effectiveness of emissions reductions efforts worldwide, Caribbean governments must continue to make decisions to plan for the future. The Regional Framework is founded upon the principle of using risk management processes and tools to aid decision-making. Decision-making based on subjective value judgments given the challenges and uncertainties we face, will compromise resilience building. Risk management assists in the selection of optimal cost-effective strategies for reducing vulnerability, using a systematic and transparent process. Policies or initiatives that aim to reduce this vulnerability can be designed to complement and support the goals of poverty reduction, sustainable development, disaster preparedness and environmental protection. The Implementation Plan developed by the Centre to guide the operationalization of the Regional Framework for Achieving Development Resilient to Climate Change highlights as a priority challenge the need to utilize risk management tools and processes to aid decision makers. The Caribbean Risk Management Project builds on the work started by the Region in 2003 in the development of Risk Management Guidelines for decision makers, but is intended to be more attuned to the needs and special circumstances of the Region given the prevailing conditions. It will also incorporate the development of new tools and risk management methodologies. The Project will be executed in a phased approach. Phase 1 will be the development of a risk management, web-based tool to guide decision making. Phase 2 will provide in-depth training for country decision-makers. Phase 3 will undertake detailed risk assessments in selected countries. The overall objective is to embed risk assessment into decision-making and management systems across the region in finance and planning. Embed considerations of climate change across the Caribbean, through the development of regional approach to risk management and the creation of a risk ethic in decision making. 1 Initial consultation and scoping phase including workshops and in-country meetings in three pilot countries together with a review of existing approaches to risk management in the Caribbean. 2 Review CARICOM Climate Risk Management Guidelines. Develop a revised risk management framework for the Caribbean taking into account the latest developments in climate risk management techniques. This will be fully supported by existing resources and materials and will link into the latest information on climate science, vulnerability assessments and impact modelling, together with economic, environmental and social system baseline data. The new framework will link into the CCCCC information clearing house. 3 Working with the CCCCC to secure CARICOM approval to the revised Caribbean Risk Management Framework. 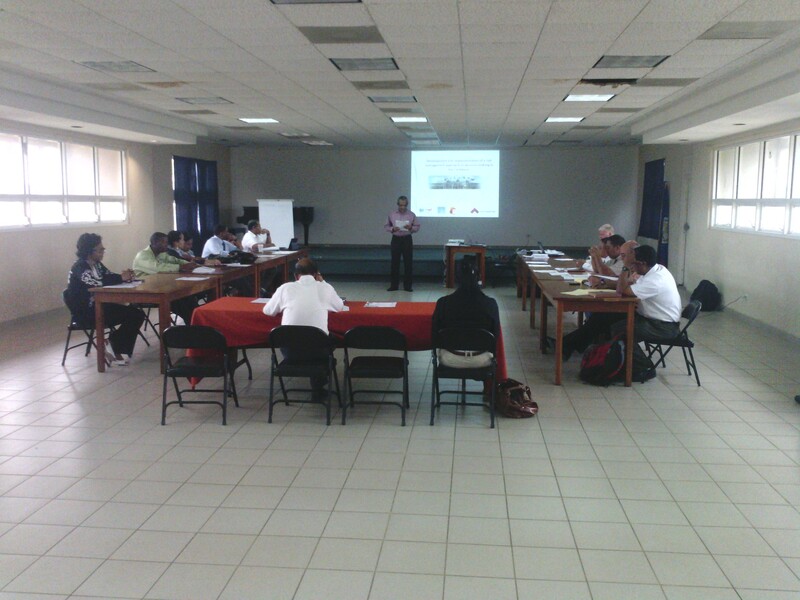 4 Launch Caribbean Risk Management Framework at a high profile event. 5 Develop an on-line version of the Caribbean Risk Management Framework with full guidance and links to other tools and techniques. 6 Develop an online ‘stress-test/screening’ tool to enable all organisations (including donors and development banks) operating at regional and national levels to take a high-level view of policies and decisions against the potential impacts of a changing climate. 7 Working with the CCCCC to provide assistance and support in implementing the communications plan aimed at raising awareness in the Caribbean regarding a risk based approach to decision making. By caribbeanclimate in Featured Project on February 18, 2013 .